May still be temporarily closed due to electrical fire in Jan 2015. The Sundown Tavern was apparently located on three of the four corners at this intersection, including the former laundromat building which would eventually become Sweet Lou's and now the Lamplighter Public House. New ownership assumed control in June of 2013 and would seem to want to gentrify the joint a bit. In addition to general cleanin and fixin and good beer addin, they've created patio seating out front. 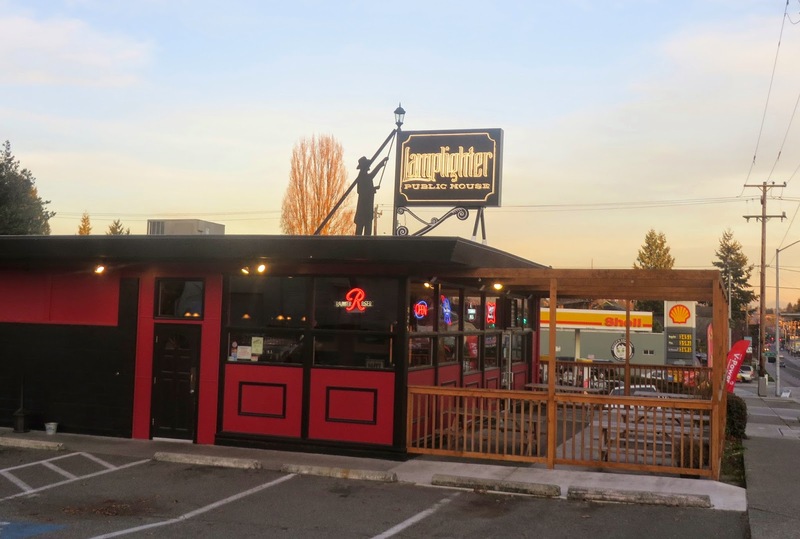 It's gotten less divey with each ownership iteration, and it's now a fairly typical neighborhood bar, owned by the Stedman family who also run the Magnolia Village Pub and now the more Bellevue-ish Normandy Park Ale House. I'm confident that most the neighbors like it better this way, though I have a weak spot for the divey old version with aged patrons and bartender.